Fair times – For the fainthearted . . .
Bridgwater was the big day out; it took at St Matthew’s Field. Was there always mud? I certainly remember going in Wellington boots. The street approaching the field was lined with ‘cheapjacks’ intent on parting people from their money. The offers were too good to be true, but everyone knew they were, that was part of the entertainment, watching to see who might be taken in. As the field was approached there was a gateway through which the countless thousands of feet passed. The ground would have been well churned up by the Saturday evening, the closing night of the fair. Stalls and other stuff were OK for grown ups, it was the funfair that was the magnet for a small boy clutching a half-crown. Looking back now I’m sure it was gaudy and garish and completely unsophisticated, but to a child who lived in village of 300 people and went to a two classroom school that had just 40 pupils, this was the most amazing place. This made Long Sutton look like a sideshow. The rides were often frightening, more for watching than trying; there were constant wonders to discover as we pushed through the throngs. I remember tents that were forbidden to small boys, but perhaps my imagination invented them. In my memory, there were at least a boxing ring and another involving the charms of some lady. Did they exist or are they the later interpolations of a mind fed on stories of travelling shows and circuses? Is there the same magic now? Where do half-crown clutching children find a world of excitement and delight? The world has become a prosaic place but sometimes there are moments when the excitement of those days is for a moment recalled. 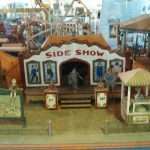 A few years ago, visiting San Francisco’s Musee Mechanique, an eclectic collection of fairground machines, I wondered at there being no admission charge, but with a fistful of 25 cent coins, I realized quickly how the place paid for itself. There were so many tempting machines that the coins were quickly used up. 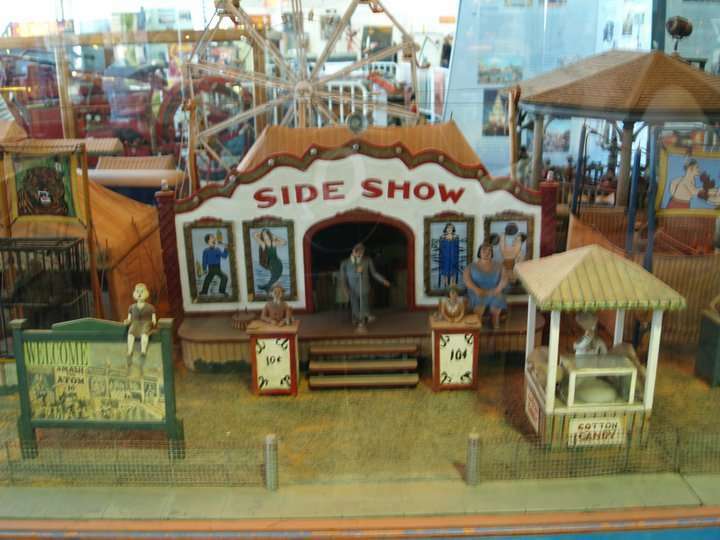 One machine was a large glass display case containing a complete carnival, feeding the machine with a quarter brought it to life; lights came on, things moved, the scene was animated. The magic of those days at Bridgwater was for a moment recaptured. The machines are laughable compared to the technology now in everyday use, but their capacity to evoke a world of the imagination is unparalleled.